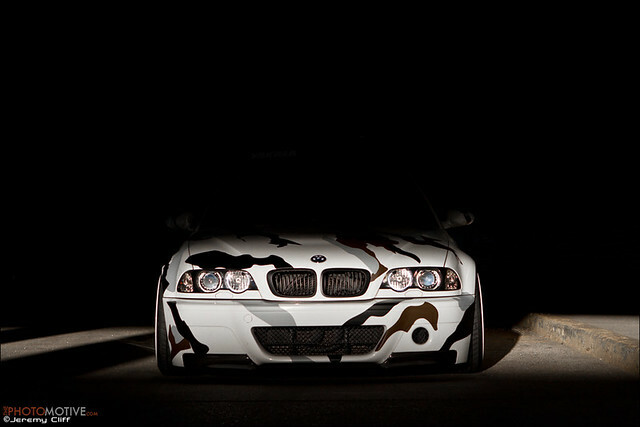 I shot some photos of this arctic-camo e46 M3 for Stance:Nation not long ago. The article just went up on their blog over the weekend, check it out for info on the car/specs. Sweet pictures! Thanks for sharing. Love it! And the emblem. +1 on the emblem looks awesome! Last edited by sry110; 09-06-2011 at 10:30 AM. Got me thinking "Eat More Chikin"
Eh. Points for creativity and the emblem but I see enough camo wrapped BS in NC. I've actually never seen another camo wrap in person here in Chicago, so it's fairly new/unique out here. It's definitely not a car for everyone.